Oakland, CA – Employers now have a new way of finding out whether students have met industry standards to succeed in both college and career. The Linked Learning Alliance (Alliance) officially launched its industry-backed digital badges within Linked Learning Certification. Pathways can earn badges to provide evidence that students are gaining specific skills and qualifications needed to be successful at an entry level in a particular industry. 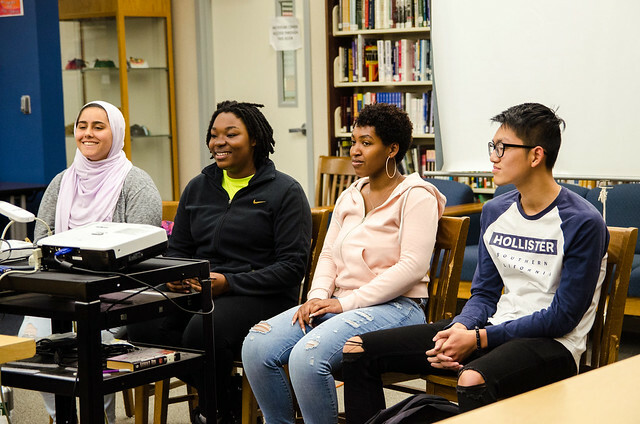 The Alliance, in partnership with Sutter Health, convened a number of industry and education leaders at Oakland High School‘s Public Health Academy this week to learn more about Linked Learning and showcased for health system employers the newly launched industry badges. They are now available for health pathways that have achieved Linked Learning Silver level certification or above on Linked Learning Certification. When a pathway earns one of the badges, they validate that its students are prepared for the health care workforce and qualify their students for 1) internship placement preference, 2) financial support to take the Medical Assisting State Exam, and 3) scholarship eligibility. The Alliance’s new video highlights how the badge system works. Industry-backed badges incorporate criteria set by employers for what skills and knowledge students need to succeed in various sectors of the workforce. They offer a unique way to visualize skills and qualifications students gain beyond the traditional diploma. The visit to the Public Health Academy on May 29 (see pictures here) was an opportunity to showcase the culture and design of an exemplary Linked Learning pathway and the newly launched badges. Oakland Unified School District‘s student population is culturally diverse and predominantly low income. The district is implementing Linked Learning wall-to-wall because it has evidence that students in Linked Learning pathways and academies are graduating from high school and enrolling in postsecondary education at higher rates than their non-pathway peers. Participants at the convening saw first-hand how a partnership between industry and a Linked Learning pathway can be mutually beneficial when students gain engaging and practical work-based experiences and skills valued in the health sector, an industry that is concerned about meeting future workforce needs. Smith-Dohring cited Linked Learning’s industry digital badges as a tool for employers to help ensure skills development in education authentic to the needs of the health sector. It is a strategy to increase students’ mastery of skills needed to be successful in the industry and to help make high-quality Linked Learning available at scale. While health care is the first sector to have digital badges on Certification, the Alliance hopes that employers from other industry sectors will be inspired to collaborate so that more students will benefit from badges that signify their readiness to succeed the workforce. This entry was posted in Press Releases on Thursday May 31st, 2018 by David.